Local councils: Bedford Borough, Central Bedfordshire, Luton Borough and Milton Keynes. The population of over 970,000 is younger than England as a whole, with 19.7 per cent aged 0-14 years and just 6.2 per cent aged 75+. 14.8 per cent live in the most deprived areas of England. The organisations in the area are working together to ensure that almost a million people get the information, support and access to services that they need to live healthy lives for as long as possible. When people are ill or need social or community support, services will be delivered in a way that meets their needs and in the best place – whether that’s in someone’s home, a GP surgery or a hospital. Residents will have the knowledge they need to make informed choices about their own health and wellbeing, including an understanding of the services on offer and how to access them. GPs will lead specialist teams of health professionals including community and specialist nurses, care co-ordinators, therapists, pharmacists, dietitians and other clinical and support professionals. The team will focus on those most in need, for example people who are chronically ill or who have complex diseases. There will be an equal focus on community and mental health services to support people to manage their health and social care issues in the community and, wherever possible, avoid being admitted to hospital. Technology will help make patient information available across the whole of primary, secondary, social, mental and community care, enabling teams to provide safer and better care for patients. This will prevent people having to repeat information, which has been an issue raised by local people. Social workers, clinicians and clinical support teams will work in an integrated way, meaning that patients will benefit from coordinated packages of care. Staff in nursing and residential care homes will play a more proactive role in care and be treated as vital members of the wider integrated team. They will have immediate access to shared care plans and work alongside community clinicians. 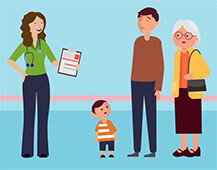 People will be educated to understand the difference between an urgent care need and a life-threatening emergency, supported by the development of responsive, trusted and well-signposted urgent care services. Fewer people will be admitted to hospital in an emergency and more people will be treated in community settings instead. The three hospital sites will work in an integrated way, using the latest advances in medical practice and technology to provide a safe, high quality service and the very best clinical outcomes. Hospitals will make maximum use of technology to support patients and clinicians in the community. The digital transformation planned across the area will give teams across community, primary and secondary care the ability to work smarter and access accurate information where and when it is needed. It will also enable better service planning through the use of population analytics so that services can be provided in the areas where most needed. During 2018 BLMK will progress work towards delivering a shared health and care record. The ICS has also progressed work on a number of other key digital projects including care homes digitisation, e-consultations and remote monitoring.